Out along the edges/Always where I burn to be. The further on the edge/The hotter the intensity. The F-4 Phantom II supersonic jet interceptor aircraft/fighter-bomber was designed as a defense fighter plane. It became one of the most popular multi-purpose jets in U.S. history and one of the best-known military icons of the Cold War. 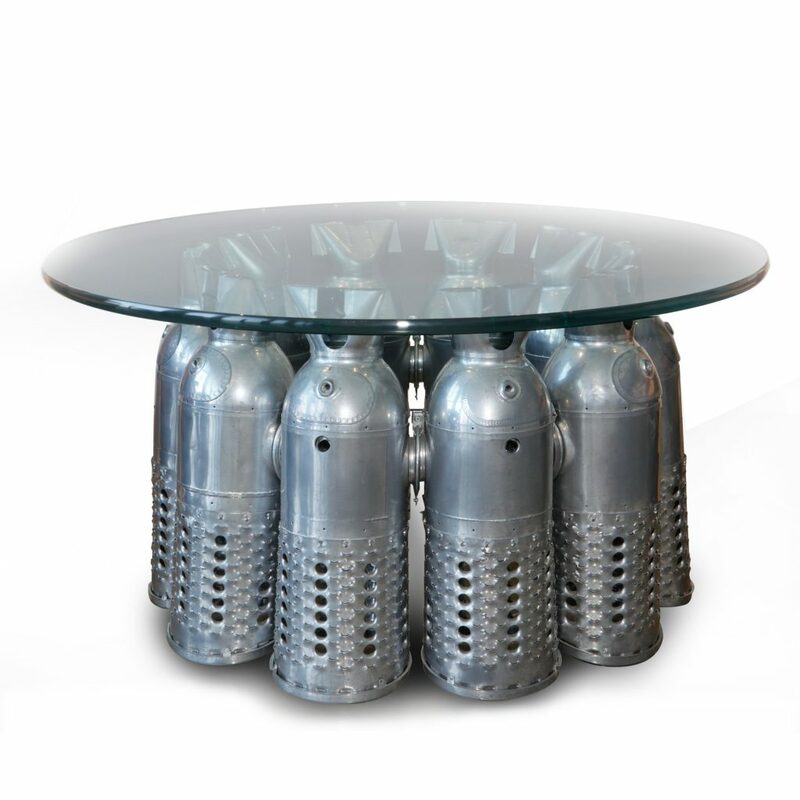 Our limited edition Phantom table is made from ten authentic burner cans off an F-4. The meticulously restored burner cans have been powder coated in reflective silver and the cluster, which is engineered in a circular layout, is topped with tempered glass. McDonnell Douglas Aircraft developed the F-4 for the United States Navy; it entered service in 1960. Proving highly effective and adaptable, it was also adopted by the U.S. Marine Corps and the U.S. Air Force, and became a major part of their air operations during the second half of the 20th Century. The F-4s were produced from 1958 to 1981, with nearly 5,200 built, making it the most numerous American supersonic military aircraft. A large fighter, the Phantom had a top speed of over Mach 2.2. It set 15 world records for in-flight performance, beginning in 1959, including an absolute altitude record, and an absolute speed record. During the Vietnam War, the F-4 served as the principal air superiority fighter for both the U.S. Navy and U.S. Air Force. The Phantom was the last U.S. fighter plane flown to achieve ace status in the 20th century. It was a major part of U.S. military power throughout the 1970s and 1980s. The F-4 Phantom was the only aircraft used by both U.S. flight demonstration teams, the U.S.A.F. Thunderbirds and the U.S. Navy Blue Angels. The F-4 Phantom’s nicknames included “Old Smokey,” “Snoopy,” “St. Louis Slugger,” and the “Flying Footlocker.” Because of its success against Soviet-built MiG aircraft, it was called the “World’s Leading Distributor of MiG Parts.” The aircraft was officially retired from U.S. service on December 21, 2016, and the remaining airframes demilitarized in January 2017. Each limited edition House of Whitley F-4 Phantom Table includes 10 authentic burner cans in a circular, 34” diameter layout, x 21” high. Each burner can is powder coated in reflective silver, and the cluster is topped with 3/8” tempered glass, 40” in diameter. This entry was posted in Aviation Design & Decor. Bookmark the permalink.